Extra resistance to moisture and sagging in exterior ceiling applications. PABCO® EXTERIOR SOFFIT Board is designed for application on the underside of exterior soffits, open porches, walkways, carport ceilings and similar installations that are completely protected from contact with water. The gypsum core contains additives that enhance its ability to resist sagging. The core is wrapped in a moisture resistant paper to further increase its resistance to moisture. 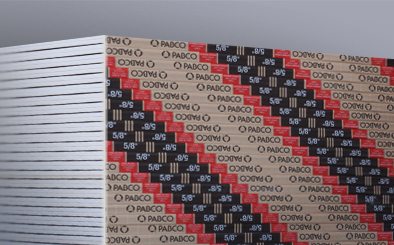 1/2” PABCO® EXTERIOR SOFFIT is available in Regular and Super C formulation and is used in residential construction. 5/8” Type X PABCO® EXTERIOR SOFFIT is used in commercial buildings when fire rated systems are required. 5/8” Type C PABCO® EXTERIOR SOFFIT is used in commercial buildings when extended fire rated systems are required. G502, G504, G515, G523, G524, G526, G527, G528, G529, G530, G531, G533, G534, L502, L503, L504, L507, L510, L512, L514, L524, L525, L530, L542, L587, P237, P510, P512, U312, U313, U317, U320, U406, U410, U412, U426, U428, U429, U435, U436, U438, U440, U441, U443, U444, U448, U451, U452, U453, U454, U455, U467, U474, U478, U529, U608, U620, U910, U912, U914, V418, X507, X513, X514, X515, X518, X520, X521, X522, X523, X524, X530, X531. G501, G503, G505, G507, G508, G520, G531, L501, L508, L532,L556, L591, N501, N502, N505, P225, P227, P727, P230, P235, P250, P254, P259, P266, P302, P508, P510 , P516, P517, P540 ,P541, P743, P745, P747, P749, P751, P811, P829, U017, U026, U032, U040, U204, U207, U208, U301, U302, U305, U309, U321,U326, U329, U330, U332, U337, U338, U339, U341, U342, U344, U351, U354, U355, U356, U357, U358, U360, U364, U369, U374,U379, U411, U418, U420, U421, U425, U434, U436, U439, U442, U445, U449, U450, U460, U465, U466, U467, U469, U473, U475,U485, U487, U494, U495, U502, U504, U505, U506, U510, U512, U609, U615, U617, U622, U623, U626, U633, U637, U646, U647,U648, U651, U652, U926, V304, V310, V417, V419, V420, V421, V430, V431, V432, V434, V435, X508, X510, X516, X517, X525,X526, X527, X528, X538, X602. D301, D501, D502, D505, G501, G503, G505, G512, G515, G521, G523,G525, G526, G527, G528, G529, G530, G531, G538, J501, J503, J504, L501, L505, L508, L511, L512, L513, L514, L516, L520,L523, L525, L526, L527, L528, L529, L530, L538, L539, L540, L541, L588, L591, L592, L598, M508, M519, N501, N502, N505, P502,P503, P504, P505, P506, P507, P508, P509, P510, P513, P514, P519, P549, P554, U023, U301, U302, U305, U309, U311, U329,U333, U334, U340, U342, U354, U355, U374, U379, U411, U428, U429, U442, U445, U451, U457, U465, U466, U467, U469, U473,U485, U501, U502, U504, U505, U506, U510, U512, U602, U605, U617, U627, U642, U643, U645, V304, V310, V414, V417, V419,V495, X501, X502, X504, X508, X509, X516, X517.